HomeNonthaburiWeekend Bangkok Island Tour: See Koh Kret Like You've Never Before! Let's visit the historic and culture-rich Koh Kret with me and get a glimpse of Thai food culture and the most beautiful Buddhist temple there! We'll go on a sightseeing tour on a boat and we'll do many fun activities together. Arrive at Wat Sanam Nuea Temple. Take a boat across the river to Koh Kret, where it is filled with the old history of the Thai Mon culture. Take a boat trip around Koh Kret, and you'll do activities such as Batik painting! 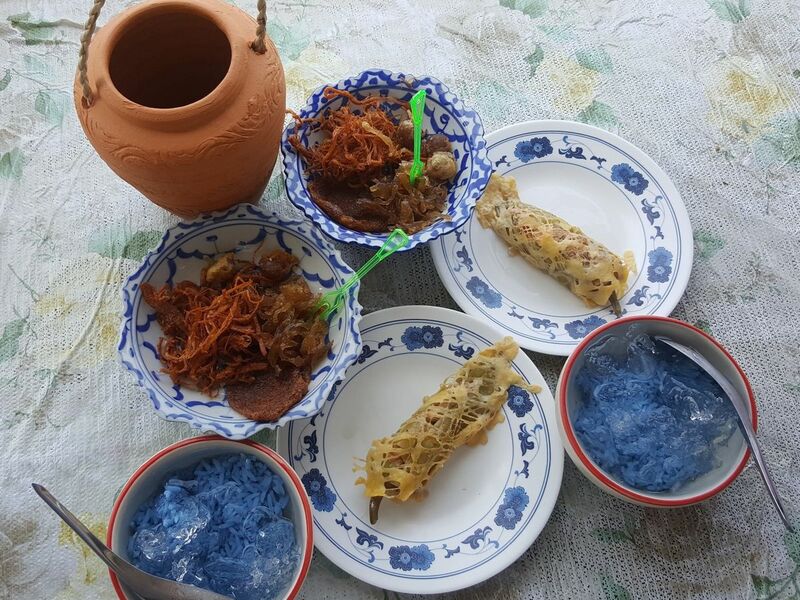 Let's continue our trip by stopping at a Thai desserts house to taste the local Thai desserts or you can even try to make them! Enjoy sightseeing, and observing the local's style of living! During lunch time, you can choose your Thai dish or taste some local street food! I personally recommend you to try "Khao Chae" or rice soaked in cool water. This menu is famous in Koh Kret! Now, we'll visit a ceramics shop. You can also learn how to do pottery or ceramics. Let's appreciate the local culture! Here, you can try different local foods and buy some souvenirs back home! The trip ends now! I'll drop you off at the hotel lobby or any BTS station. I hope you've had a great trip! If you are looking for place where less touristy this place is best choice for you. Koh Kret is the only island near Bangkok. There are so many Thai food/snacks and resonable price. This place is full of history and old memory. We much enjoyed Boom's trip, especially the batik and pottery activities. Our guide was extremely friendly and speaks excellent English.